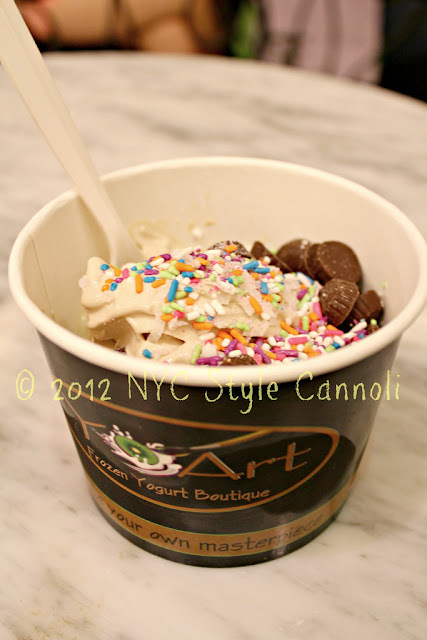 We are now visiting YoArt, a yogurt boutique, in the fabulous Plaza Hotel Food Hall. 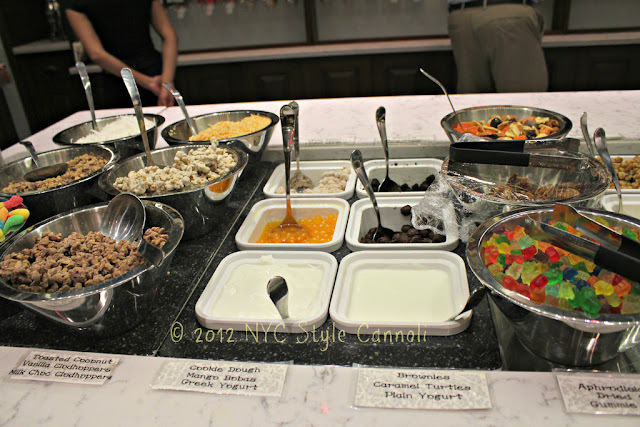 I was so excited to try it as heard really great reviews and I love yogurt! YoArt offers 12 flavors each day, you can follow them on twitter for daily updates. 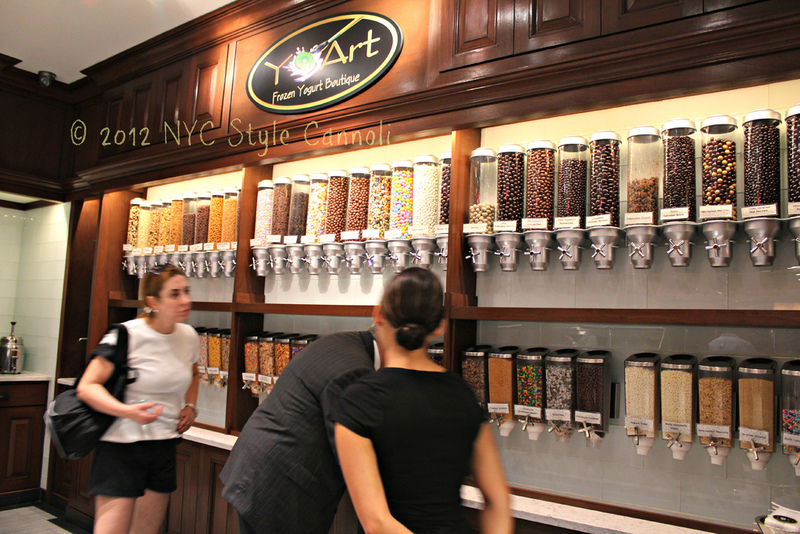 The flavors including non-fat/low-fat flavors, a no-sugar- added option, a sorbet, an original tart, a Greek yogurt and Eloise Strawberry, an exclusive Food Hall flavor in honor of The Plaza's favorite guest. Most flavors are gluten-free and all are teeming with four strains of probiotics, which help maintain a healthy digestive system. You can taste the flavors before you decide to see which one you like the best. You can also mix flavors if you wish, I believe Peanut Butter and Coconut were my choice. YoArt also offers over 90+ high-end toppings, including organic granola, champagne cordials, pure chocolate sprinkles, fresh whipped cream, and organic fruit (when available). If you cannot find a topping here you like, there is something really wrong with you. 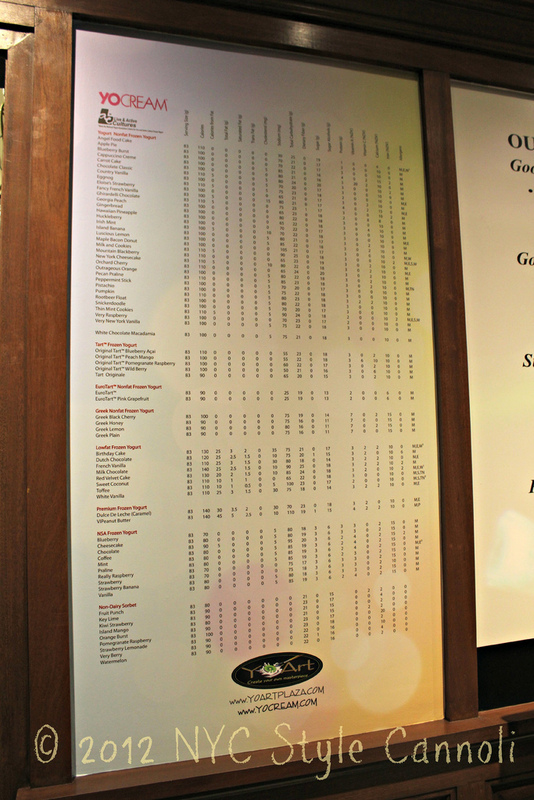 The selection is mind-blowing! Fresh fruit looked so yummy ! My choice with mini peanut butter cups and sprinkles. Everything tastes better with sprinkles! The flavor of this yogurt was so true, and intense I really enjoyed it very much. You help yourself to how much you want and then they weigh it which is how you are charged. 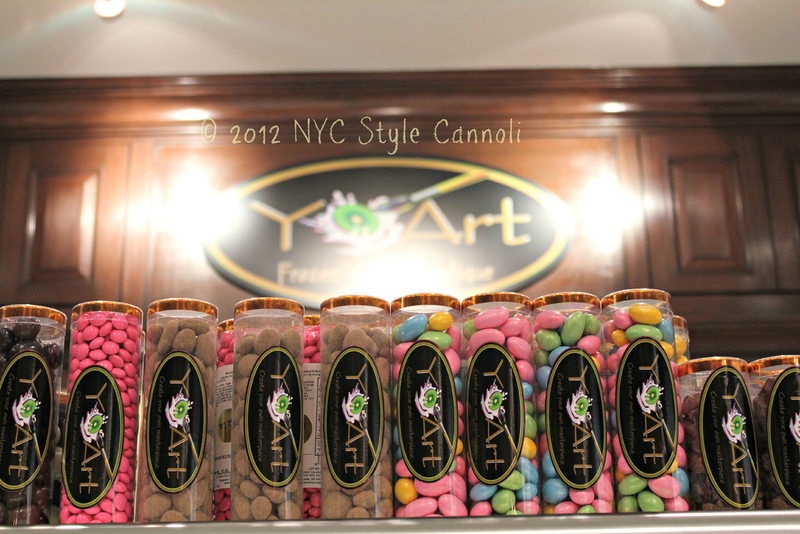 Each quarter, YoArt will donate 1% of sales to a local charity, in an effort to support the community and unite people around important causes. Their first supported charity will be City Harvest, which collects and serves food to the hungry. 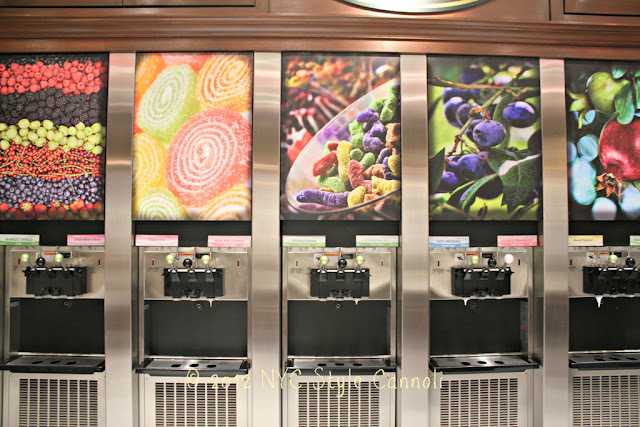 I find that to be a wonderful idea, and I highly suggest you visit when in The Plaza Food Hall. Next flavor I must try is Thin Mint Girl Scout Cookie. I cannot seem to get that out of my mind. 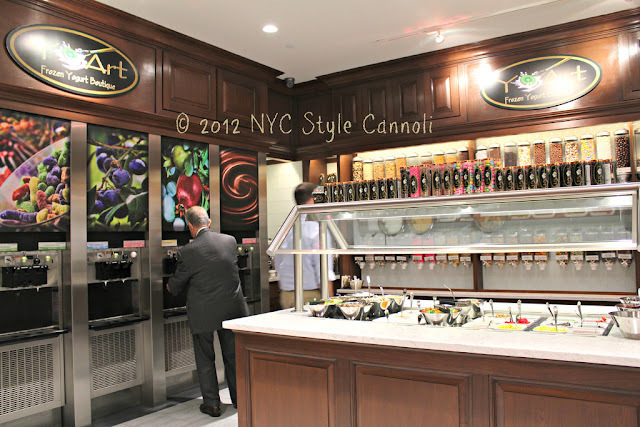 YoArt Frozen Yogurt Boutique is located in The Plaza Food Hall, on the concourse level of The Plaza Hotel in New York City. For more information, please visit them on facebook and twitter!! And in person, of course!! Hours are Monday thru Sunday 11am to 930pm. Omg this place looks like heaven. 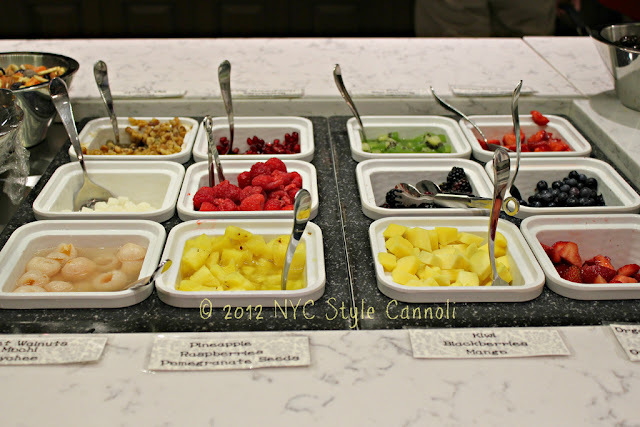 I love alll those toppings! Your blog is just fantastic. Not only does it look fantastic (edible), it is written extremely well. You continually come up with these fantastic posts on fantastic subjects. I would have so much fun there. Thank you so much Bob for your kind words. You have been so supportive from the beginning and I so appreciate it!! This is MIND BLOWING indeed! Oh gosh! I can't get over the selection. I love the setup and they give back. WHAT more could you ask for!